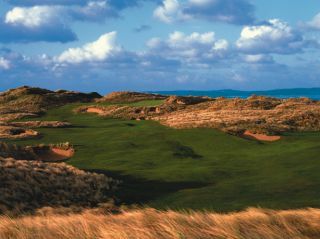 Greg Norman made full use of the natural landscape in his development of Doonbeg Golf Club. 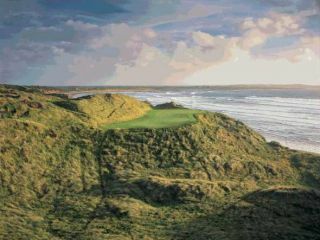 Located in County Clare between Lahinch and Ballybunion, Doonbeg is characterized by rolling fairways interwoven among massive, grass-covered sand dunes. The different variations of the wind speed andand direction ensure the Doonbeg course plays differently each and every time. It is expected that an 18-hole round of golf at Doonbeg will take no more than 4 hours and 30 minutes. The Par-72 layout features a single loop of nine holes out and nine back, playing 6,885 yards from the back tees. The most natural routing within the existing dunes resulted in an uncommon combination of five par 3s and five par 5s. Wind direction and speed determines consistent variation in play – for example the average golfer will play from a sand wedge to a 5-iron on the 111 yard 14th. To allow for a range of conditions and abilities most holes feature five or more tee locations.